Brooksville In Its Third Century! April 10: Regular Meeting 4:30 p.m. <Note Time! 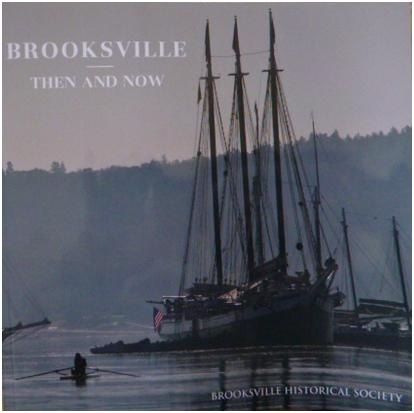 7:00 p.m. April 17: "Night of Nostalgia"
The Brooksville Historical Society invites the community and friends to a slide presentation of 100 historic photos of Brooksville. Share your memories and stories of the people, places and events in Brooksville. All are welcome. Wednesday April 17, 2019 at 7:00 pm at the Brooksville Town House. We will be open next summer with our new look and location!!! The Brooksville Historical Society is a tax-exempt [501-(c)-3] charitable organization entirely run by volunteers. Donations allow us to maintain the town's museum and research Brooksville's history, and are very much appreciated. Your contributions are always welcome! Send to: BHS, P.O. box 91, Brooksville, ME 04617, and thank you! Tales of ships, shipyards, and mariners in and from Brooksville. A Compilation of Photographs from the past with current pictures taken from as close to the original vantage points. The first printing sold out, new copies available at the Brooksville Public Library or to have a copy mailed to you send $24 to BHS, P.O. box 91, Brooksville, ME 04617. The Brooksville Historical Society Museum Building has MOVED! And it is now better looking! marine artifacts, farming and blacksmith tools, kitchen utensils and other household items. Genealogical information including journals, bound family histories, photographs and compilations by researchers of cemeteries and vital records are on site and the expanded lower level space allows for safer archival storage. The museum facilities include the hearse house and gardens, as well as a farmhouse currently under restoration.